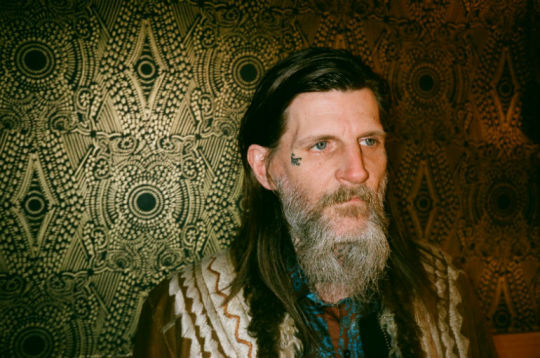 After a sojourn in the U.K. exploring the history and folklore of the British Isles while performing under the moniker drcarlsonalbion—a period that saw collaborations with Steeleye Span’s Maddy Prior and The Hackney Lass, aka Rosie Knight—Dylan Carlson is now back in thoroughly American territory. The Seattle musician’s latest offering, Conquistador—released April 27 via Sargent House—is a meditation on the legends of Mexico and the American Southwest, tracing the real-life account of Spanish explorer Álvar Núñez Cabeza de Vaca. You mentioned in an interview last year that your work under drcarlsonalbion was something you wanted to keep separate from the canon of Earth albums. How do you feel Conquistador fits into the progression of your more recent solo work, as well as your earlier work with Earth? Originally, as I intended it, the drcarlsonalbion thing was to be specifically about English folklore and music and general English things, and then, obviously, English folk music had a big influence on the [2011 and 2012] Angels of Darkness, [Demons of Light I and II] records, but I sort of didn’t want to restrict Earth to just that, because Earth was always sort of evolving over albums. I wanted Earth to be free to do Earth things. But this album, it’s part of the same line from [Earth’s 2005 LP] Hex; Or Printing in the Infernal Method to the soundtrack for [the 2013 film] “GOLD” and this one. The soundtrack was originally intended to be released just under my name, but the manager I had at the time put drcarlsonalbion on it, because for him, that was like, “Oh, that name, it’s already known, so it’ll be easier.” I’m not currently with that manager anymore for a number of reasons, that included. But yeah, the thematic content is more to do more with American stuff like the West, and it’s like Hex… in that it’s like a soundtrack to an imaginary film in certain ways. So, I guess you could say, thematically, it’s like a branch of the Hex… side of things: the interest in what’s now the Western United States—what was, at one point, Mexico and, before that, was native—but I guess that’s how they’re all tied together. At least in my head. But unlike Hex…, which was based on Cormac McCarthy’s novel “Blood Meridian” and the GOLD soundtrack, this one is based on real-life events? I mean, it’s not based on any specific text. The idea was left over in my head from when I was a kid in middle school. I lived in Texas, and we had Texas history classes. There was this conquistador who had a Moorish companion called Esteban traveling in what was then Northern Mexico. They basically got lost for 20 years and, then, made it back to what’s now Texas and the Gulf of Mexico. I think they got as far as what’s now Utah and ended up being sold into slavery by one tribe and escaping that and living with other tribes. Things didn’t go as planned, I guess you could say. It’s definitely a much looser thing. I mean, it’s sort of how stories worked in the day. They change and grow and get added to and subtracted from. Folk songs do the same thing, like how “The Elfin Knight,” which was originally about supernatural encounters with fairies, became “Scarborough Fair,” which is a song shorn of any otherworldly concerns, and then, it became “Girl From the North Country” and was a Bob Dylan hit. It’s similar in that way to how tales adapt to their environment and change. You 2016 solo record, Falling with A Thousand Stars and Other Wonders From the House of Albion, drew a lot on ideas of psychogeography and the relationship of music and folklore. Did you find any elements of this carried over now that you’re working on American themes? Yeah, I mean, obviously they touch one another in some respects, but America is very different. The oldest history of the country and the landscape has been destroyed and lost and has to be discovered in different ways. There was a concerted effort to eradicate the native population, and then, the ones they couldn’t eradicate, to eradicate their languages and histories, and that has left the landscape wide open to a lot of interpretations. Then, the history that is there—obviously, because it’s written by the so-called winners—it doesn’t go back very far in some places. I mean, it does, really, but again, a lot of that is closed to the traditional methods of investigation: there’s no books and no maps. Both Conquistador and Hex… are broken up into sections, like the way McCarthy presents “Blood Meridian”—there are a couple of very brief statements of things that take place in the chapter. Is that something you were channeling with this? I’ve always quite liked that idea. I mean, with instrumental music, because there’s no lyrical signposts for people to grab onto, I’ve always felt the titles are especially important. I’ve always felt strongly about the narrative—I know it’s like, in postmodernism and all that, the narrative is viewed as sort of evil and whatnot, but I’ve never had that, because I quite like narrative. But I mean, to me, not only should the songs have a narrative arc, the album needs a narrative arc too. I feel like that’s something that was lost with the advent of the CD and, now, digital media. The whole thing is important. How did making Conquistador compare with your earlier work in terms of composition? This one was less composed than a lot of Earth stuff. It was going to be just me, and then, Emma Ruth Rundle was kind enough to come along and add her bit of magic. I had musical ideas and motives, but the structure came during the recording process. In that way, it was similar to how the Angels of Darkness… records were created. The structure is quite loose and improvised. Then, the last song, [“Reaching the Gulf”], the return part, that was the most composed and the most structured. So, it reinforces the theme in that sense. You’ve mentioned in the past that finding the right combination of people to collaborate with has always been an important but also quite difficult aspect of creating an album. How did Emma Ruth Rundle originally get involved? Is she someone you’d worked with before? Ah, no I had not worked with her. The first time I met her, we were invited down to play in L.A., and we were playing with Deafheaven and Marriages, so that was the first time I met her. Then, we did a couple other shows with Deafheaven. At the time, I was looking for management and ended up choosing Cathy Pellow who runs Sargent House and also manages Ruth, and we just sort of hit it off. I liked her playing, so that was sort of how that happened, I guess. That’s kind of the nice thing about Sargent House: it’s like all the bands are quite supportive of one another, and there’s a lot of camaraderie amongst the people around there, which is often rare in the music industry it seems these days. [Rundle] happened to be on the East Coast, and I was going there to do some solo shows, and there was a week’s gap between a couple of the shows, so we used that as an opportunity to go to [GodCity Studio] in Salem, [Massachusetts]. Were there any more recent ideas or influences you incorporated into this album? This one, no. I mean, this one—I pretty much had this material. I mean, it could have been Earth material at some point, although it would have probably been quite different that way. This one, it was more just like, “I’ve got this material,” and it was quite open, and then, it was more just a chance to work with [producer] Kurt Ballou and really have fun finding cool guitar sounds. So yeah, it didn’t have any real compositional goals. Sometimes, I’ll set little compositional goals for myself, but this one, it was very flowy, I guess. It just kind of happened quite fast and loose. I’m looking forward to going out on the road and playing these [songs] live. It’ll be interesting figuring out how to present it in a live context.